You'll be £12.99 closer to your next £10.00 credit when you purchase German Bombers Over Russia. What's this? Operation Barbarossa, Hitler's invasion of Russia, opened with an unprecedented level of ferocity, and the Luftwaffe's bombers were at the forefront of the action. German bombers launched raid after raid against numerous targets and played an essential role in the speedy conquest of vast tracts of land. German bombers were called upon to fly in conditions that varied from the heat of the Crimea to the frozen wastes of the Arctic. As the tide turned, the Luftwaffe took heavy punishment and, by the end of the war, Hitler's bombers were flying increasingly desperate missions intended to stem the advance of the Red Army. Manfred Griehl has drawn on his own unique archive to present rare photographs of the German bombers and their crews in action and on the ground. 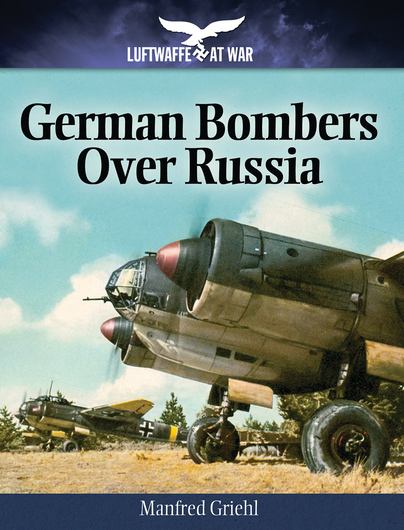 German Bombers over Russia is another valuable addition to the Luftwaffe at War series and a handy visual guide to a crucial air campaign.